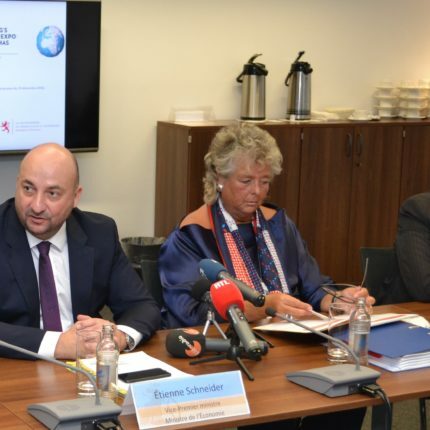 Luxembourg becomes the first country to sign the participation contract in Expo 2020 Dubai. 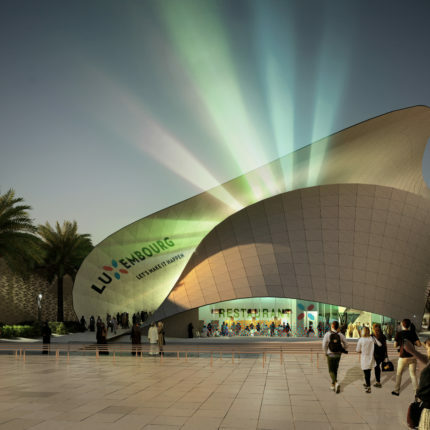 The architects Metaform in collaboration with the scenographer The Space Factory are announced as the designers of the Luxembourg Pavilion. 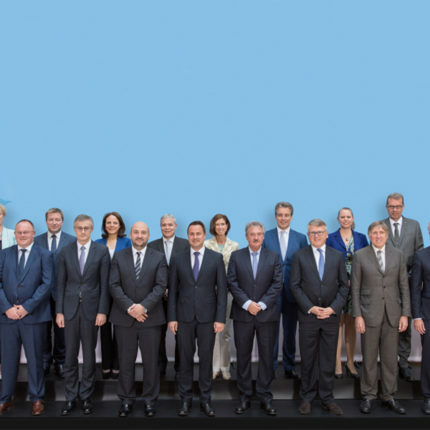 Vice-Prime Minister and Minister of the Economy, Mr Etienne Schneider, and Mrs. Nagel meet Sheikh Ahmed Bin Saeed Al Maktoum, Chairman of the Expo 2020 Dubai Higher Committee and Chairman of Dubai Airports and Emirates Airline and formally confirm Luxembourg’s participation as one of the first countries to participate in Expo 2020 Dubai. 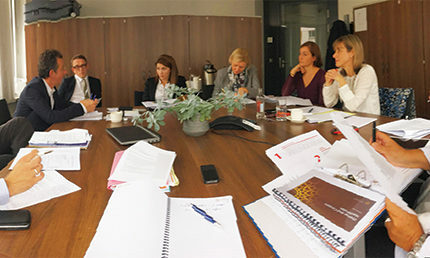 The first concept working group meets in order to elaborate the theme and concept of Luxembourg’s participation and how this theme can be materialised in the Luxembourg Pavilion’s architecture. 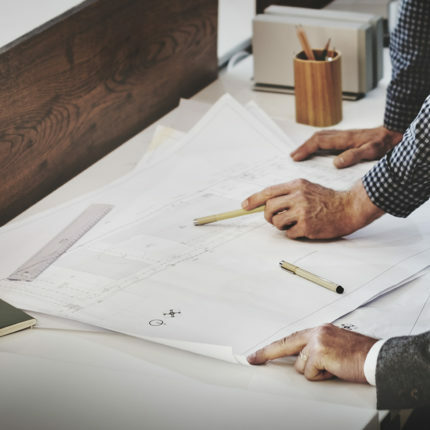 Prime Minister Mr Xavier Bettel officially confirms the acceptance of the invitation and informs Sheikh Mohammed Bin Rashid Al Maktoum, Vice-President and Prime Minister of United Arab Emirates and Ruler of Dubai, of Luxembourg’s intention to choose the option of a self-built pavilion. 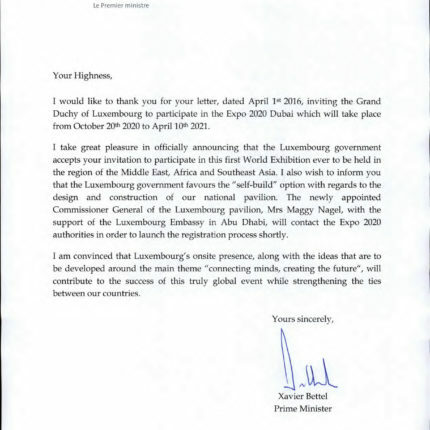 The Government of the Grand Duchy of Luxembourg formally decides to participate in Expo 2020 Dubai. 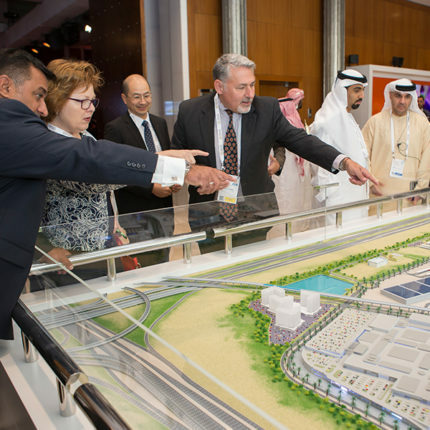 Mrs Nagel participates in the first International Planning Meeting in Dubai, organized by Expo 2020 Dubai with the involvement of the Bureau International des Expositions (BIE), the governing body for World Expos, bringing together representatives of nations from around the world to exchange views and best practices for the Expo organisation. 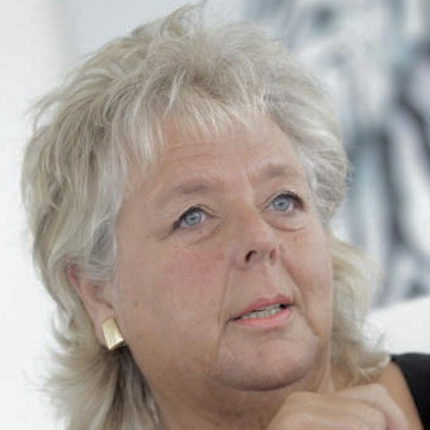 Mrs Maggy Nagel, former Minister of Culture and Housing, starts her function as Commissioner General for Luxembourg’s participation in the Expo 2020 Dubai. 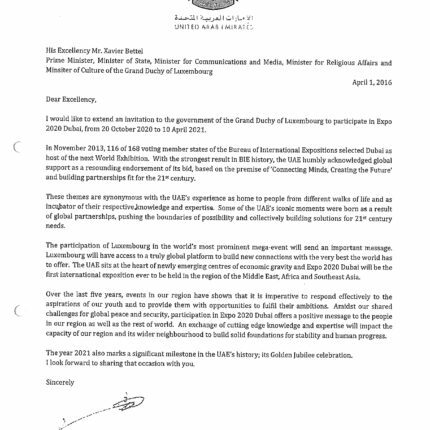 The Grand Duchy of Luxembourg receives the official invitation to participate in Expo 2020 Dubai, from Sheikh Mohammed Bin Rashid Al Maktoum, Vice-President and Prime Minister of United Arab Emirates and Ruler of Dubai.